Neuroptera is a order of net-winged insects, and includes the lacewings, mantidflies, antlions, and their relatives. The order contains some 6,010 species. The adults of this order possess four membranous wings, with the forewings and hindwings about the same size, and with many veins. They have chewing mouthparts, and undergo complete metamorphosis. Most of the larvae and adults are predators. 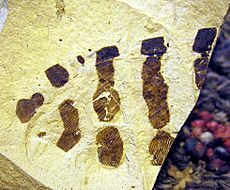 The clade first appeared in the Permian period. Neuropterans are soft-bodied insects with relatively few specialised features. They have large lateral compound eyes, and may or may not also have ocelli. 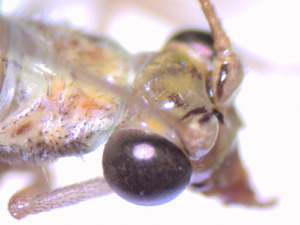 Their mouthparts have strong mandibles suitable for chewing, and lack the various adaptations found in most other endopterygote insect groups. They have four wings, which are usually similar in size and shape, and a generalised pattern of veins. Some neuropterans have specialised sense organs in their wings, or have bristles or other structures to link their wings together during flight. 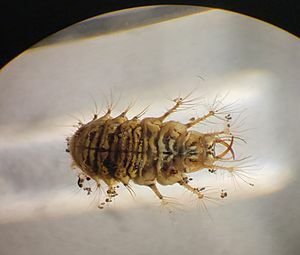 The larvae are specialised predators, with elongated mandibles adapted for piercing and sucking. The larval body form varies between different families, depending on the nature of their prey. In general, however, they have three pairs of thoracic legs, each ending in two claws. The abdomen often has adhesive discs on the last two segments. The larvae of most families are predators. 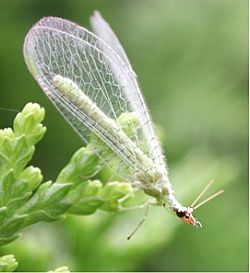 Many chrysopids, hemerobids and coniopterygids eat aphids and other pest insects, and some have been used for biological control (either from commercial distributors, but also abundant and widespread in nature). Larvae in various families cover themselves in debris (sometimes including dead prey insects) as camouflage, taken to an extreme in the ant lions, which bury themselves completely out of sight and ambush prey from "pits" in the soil. Larvae of some Ithonidae are root feeders, and larvae of Sisyridae are aquatic, and feed on freshwater sponges. A few mantispids are parasites of spider egg sacs. As in other holometabolic orders, the pupal stage generally is enclosed in some form of cocoon composed of silk and soil or other debris. The pupa eventually cuts its way out of the cocoon with its mandibles, and may even move about for a short while before undergoing the moult to the adult form. Lace wing larva or "trashbug"
Adults of many groups are also predatory, but some do not feed, or consume only nectar. Parasitism is present in all stages of this group, and is caused by beetles, wasps, and some lake flies. The use of Neuroptera in biological control of insect pests has been investigated, showing that it is difficult to establish and maintain populations in fields of crops. Neuroptera have artistic demonstrations since beginning of civilizations, which can be found in numerous art galleries such as Lacewing Design Gallery and Studio of Northampton, Lacewing fine art of Salisbury. A song on the 1999 album Suburban Light by The Clientele, "Lacewings", describes watching the insects under the influence of drugs (most likely marijuana). The New Guinea Highland people claim to be able to maintain a muscular build and great stamina despite their low protein intake as a result of eating Neuroptera among other insects. The understanding of neuropteran phylogeny has vastly improved since the mid-1990s, not the least courtesy of the ever-growing fossil record. In 1995, for example, it was simply known that the Megaloptera and Raphidioptera were not part of the Neuroptera in the strict sense, and the Mantispoidea and part of the Myrmeleontoidea were the only groups that could be confirmed by cladistic analysis. Though the relationships of some families remain to be fully understood, most major lineages of the Neuropterida can nowadays be robustly placed in an evolutionary context. Neuroptera Facts for Kids. Kiddle Encyclopedia.